In the Hot Technology Stocks article, Apple is listed as one of the hot technology stocks of year 2010. Here is a look at the breakdown of Apple revenue by market segment. Apple's iPad business has been in existence for about 9 months, thanks to Apple's ingenious move of enlarging their iPhone product with minimal changes in software re-construction and offering the larger iPad device to lead the market on tablet computing. While other companies were busily working on the development of their tablet computer offerings, Apple was busy selling the iPad. It is both rewarding and advantageous to be first to market. In such a short time, the iPad has earned Apple $9.6 billion in revenue on shipment of 14.8 million iPads in year 2010. In 9 short months, the iPad has almost reached the revenue level of the 27-year-old Mac business. Apple reported revenue of $26.74 billion and profits of $6 billion, or $6.43 per share. Revenue was up 71 percent from a year ago, and earnings were up 78 percent. Analysts were expecting revenue of $24.38 billion and earnings per share of $5.38. Apple continues to play their game of 'guide low' and 'exceed high' to gain "another blowout quarter" headlines. When asked if the iPad will cannibalize Mac sales, Apple commented that if tablet computing will cannibalize the PC market, then other players will hurt more since Apple has a significantly smaller percentage of the PC market. This is why the executives get paid the big bucks - the ultimate in positioning and spin - turning a weak position (the Mac's PC market share) into an advantage. Apple also called the CES announced Android 3.0 based tablet computers to be vaporware (they are not yet shipping and lacking performance specs) and cited Apple's first-mover advantage with the iPad along with the experience Apple has with iTunes and other apps in their huge ecosystem. 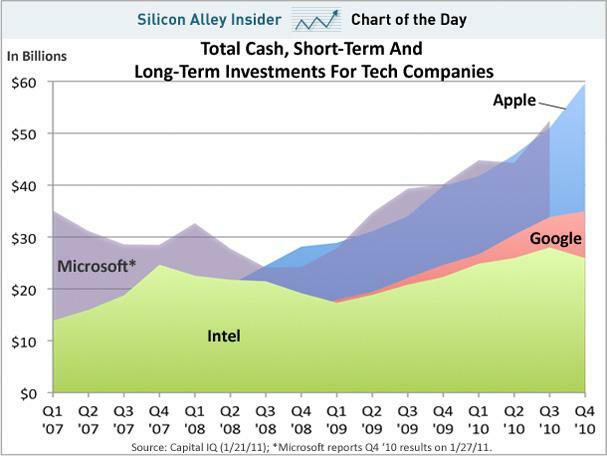 Wow, almost makes me want to go buy Apple stock!